With this keto seeded bread recipe, you can easily be able to still have sandwiches and toast. 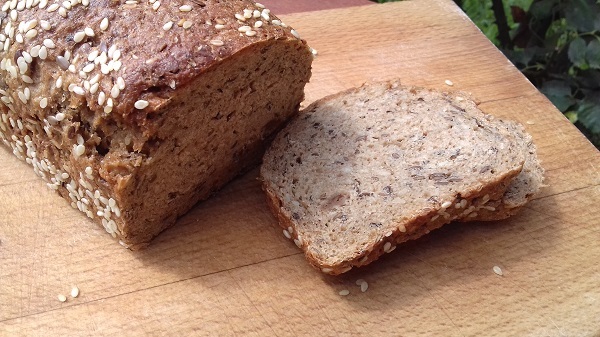 Three types of seeds in this perfect gluten-free bread. Put the eggs into a bowl and beat for 1 – 2 mins on high, Add the Psyllium husk and continue beating. Bake for 40 minutes. (Remove once a skewer comes out of the middle clean). Total carbs and serving size, please? How big are the slices? 20 slices per loaf? What size loaf pan? 405 calories for two slices is a lot! This recipe displays net carbs. Serving is 2 Slices(20 slices per loaf). You can use a 9 x 5 metal loaf pan. The recipe states that it makes 16 slices, not 20. It would be helpful to have the total carbs, fiber, and calories for the whole loaf so that folks can calculate servings according to how many slices they get from the loaf. Also, does the picture reflect a loaf made in a 9×5 pan? You can use xantham gum instead of Psyllium Husk. 1/2 teaspoon Xanthan gum will work. Can I use psyllium powder instead of the husk?